As the best Kodi Box, the Nvidia Shield TV works perfectly with the free, streaming media center app – Kodi to allow users to stream TV shows, movies, pictures, music and other digital media from local or network storage as well as the Internet. For 3D movie enthusiasts who have backed up your 3D Blu-ray into 3D ISO file formats, you may wonder is it possible to play the 3D Blu-ray ISO on Nvidia Shield TV via the Kodi app. Obviously, both Nvidia Shiled TV and the Kodi app lacks the ability to handle 3D Blu-ray ISO files. The good news is that Kodi can playback passive 3D video formats with the type of SBS, TAB, Anaglyph or interlaced. Therefore, what you need to do is ripping 3D ISO into Kodi workable 3D video types listed below for Nvidia Shield TV viewing with 3D effect. To complete the job, what you need is a 3D Blu-ray ISO Ripper. Here comes Pavtube ByteCopy. 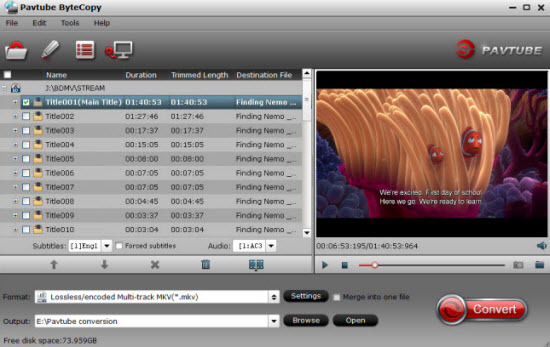 The program has perfect importing support for not only 3D Blu-ray ISO image files, but also 3D Blu-ray disc and 3D BDMV folder. 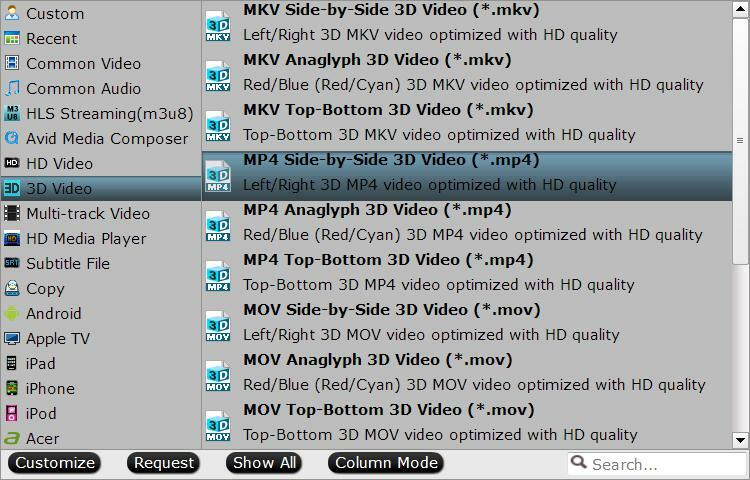 As for the output 3D format options, the application can assist you to efficiently rip 3D Blu-ray ISO to Kodi workable 3D SBS, TAB and Anaglyph type video with the format of MP4/MOV/MKV/AVI/WMV. To get better output 3D video effect, you can flexibly adjust output 3D video depth value to change the 3D depth perception, As for whether selecting the full SBS 3D or half SBS 3D, if the Kodi app is installed on a computer with more graphic power and you wish to have a better 3D video quality, just select the full 3D SBS format, if not, a half SBS would satisfy your needs. Apart from that, you can also check the “Switch Left Right” option to change the image display order for 3D SBS movie. Pavtube ByteCopy is available on Windows 10/8.1/8/7, in addition, it is also accompanied by an up-to-date Mac version – Pavtube ByteCopy for Mac for macOS High Sierra, macOS Sierra, Mac OS X El Capitan, Mac OS X Yosemite and Mac OS X Mavericks, etc. What’s more, the application helps to produce high quality results, you can’t find any difference between the ripped video and the original 3D Blu-ray ISO files. Step 1: Load 3D Blu-ray ISO image files. Click “Format” drop-down bar, select one of Kodi supported 3D format video such as “MP4 Side-by-Side 3D Video(*.mp4)” under “3D Video” main category. 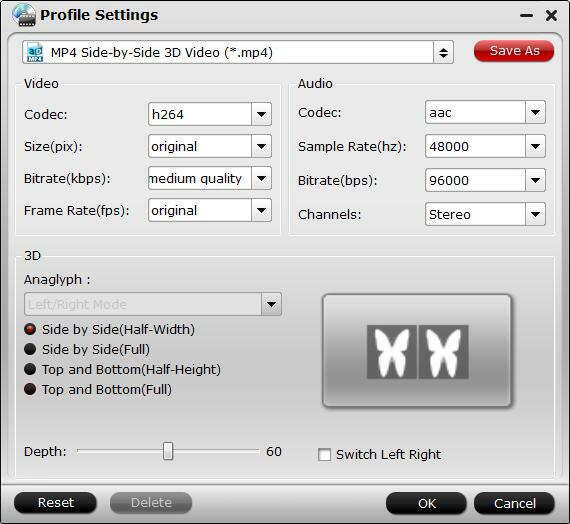 In the “Profile Settings”window, you can not only adjust the output 3D video and audio profile settings, but also change the 3D Depth by dragging the slider, select the specific 3D resolution: Side by Side (Half – Width) or Side by Side (Full) or check the “Switch Left and Right”to decide which direction images to display first for SBS 3D movie. After all setting is completed, hit the “Convert” button at the right bottom of the main interface to begin 3D Blu-ray ISO to Kodi supported 3D formats ripping process. When the conversion is finished, click “Open Output Folder” icon on the main interface to open the folder with generated files. Then add converted files to Kodi for streaming and playing on Nvidia Shield TV with immersive 3D experience. This entry was posted in TV Box.